There’s something very intuitive about interacting with electronic devices via simple gestures. Even the most technologically ignorant can grasp the idea that selecting an app on an iPhone is just a matter of tapping its icon, and as a result this kind of a technology has become nearly ubiquitous in recent years. 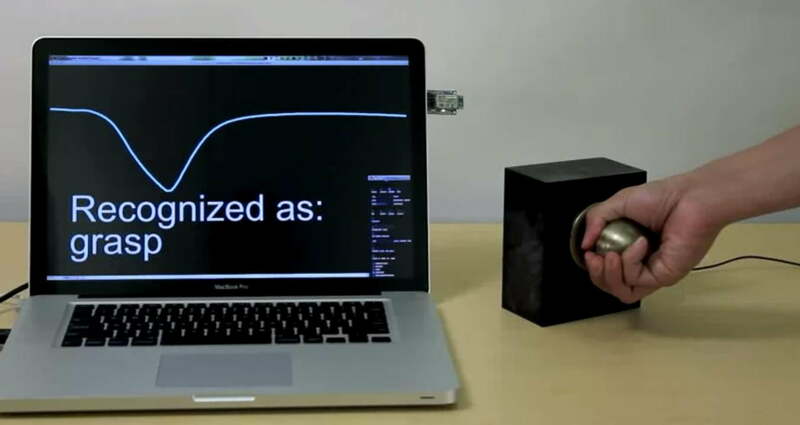 Hoping to further that, researchers at Disney and Carnegie Mellon University have unveiled a new technology dubbed Touché that allows nearly any object to recognize gestures, and transmit this information to a range of electronic devices. The theory behind Touché is relatively simple. Your iPhone recognizes touch thanks to capacitive coupling, which, in short, is its ability to detect the electrical signal transmitted from your finger to the iPhone screen. Instead of relying on a screen however, Touché detects the electrical signal sent to any object or element capable of transmitting electricity. Thus, doorknobs, tables and even pools of water can be used with Touché to control a range of gadgets. As proof of concept, the Disney Research team offered “a smart doorknob that knows whether it has been grasped, touched, or pinched; a chair that dims the lights when you recline into it; a table that knows if you’re resting one hand, two hands, or your elbows on it; and a tablet that can be pinched from back to front to open an on-screen menu.” Likewise, the team issued the video you can see below that demonstrates Touché’s ability to detect electrical signals in water. Though we’re still a ways from seeing this technology employed in the real world, Disney senior research scientist Ivan Poupyrev claims that Touché’s accuracy is nearly 100 percent, so if useful applications can be found, Touché could see consumer availability quite soon. Does The Avengers' success herald an imminent Ant-Man movie?